Teacher Gifts- done and done! My baby is graduating from 6th grade tomorrow. *sobs* Gwen has attended her current school since she was three and has thrived there. Her teachers and therapists have been wonderful so I decided to go all out and make them (all SEVEN of them) tote bags as a thank you gift. I have given these bags before but never this many at once! 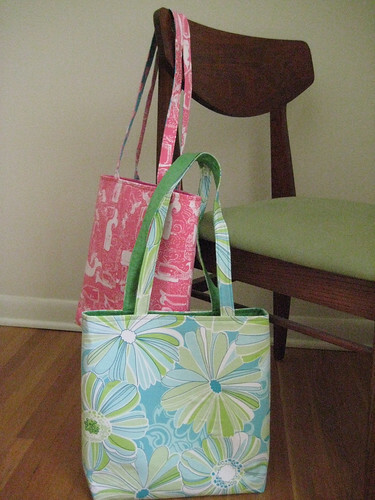 Most were made from thifted clothes with a little yardage from my stash thrown in when necessary. We gave them out this afternoon. They look kind of washed out in the sun so I took some better pics indoors. These bags are for Gwen’s Physical and Speech therapists. 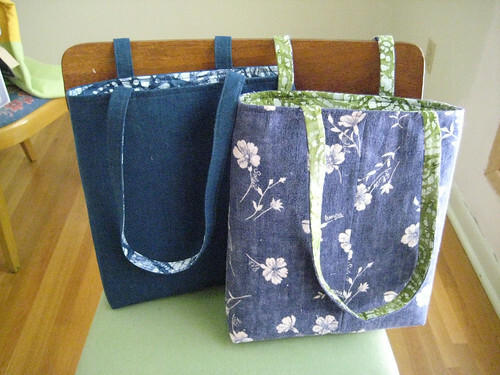 The plain blue bag is denim and batik yardage. 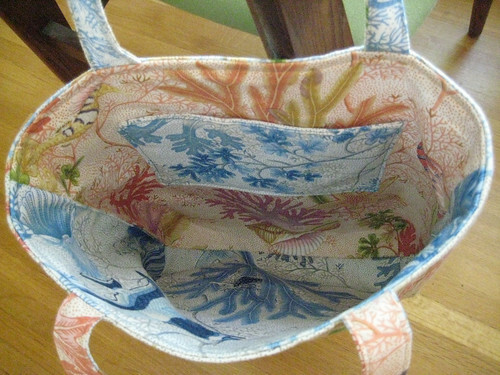 The other bag is made from a linen dress and lined with batik yardage. This one is my fav and I may need to make one for myself. The blue bag was kind of plain so I put the bling on the inside. Gwen’s PT is Filipino but became a US citizen just in time to vote in the 2008 presidential election. 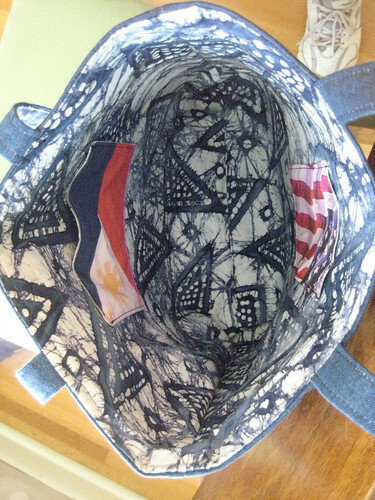 I printed the flags of both countries on some inkjet sew-in fabric sheets and used them for the pockets. He loved it! The Occupational Therapist is special because she is the one person that has been with Gwen from day 1. 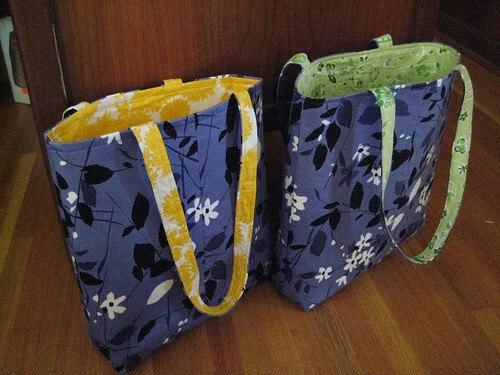 For her bag, I cut into some home dec fabric samples that came from a thrift shop a long time ago. There were four different colorways of this ocean print and I used them all. She is excited to take it to the beach this summer. I loved making these two with some pants I have been hoarding for a long time. Two of Gwen’s teachers told me that their favorite color is purple, with one specifying a purple and green color combination. The green lining was a skirt and the yellow was a dress. I had to take this picture in a dark corner so that the purple would not look blue. Finally, the other two teachers liked pink and bright turquoise blue. The pink bag made with a fabric leftover from this reconstruction. The blue and green one was a skirt and the lining was a pair of green linen shorts. Inside each bag I put instructions for making broccoli cheese soup. We have given them a quart of it every Christmas and they wanted the recipe before Gwen went off to middle school. This entry was posted on May 21, 2009 at 3:43 pm and is filed under Uncategorized. You can follow any responses to this entry through the RSS 2.0 feed. You can leave a response, or trackback from your own site. This morning I was wondering when does middle school start. Thankfully it’s only 7th grade. I’ve got a few years left. (Also A’s school goes from K to 12!) It’s always a sad day for the mama’s when our little ones grow up. The bags you’ve made are gorgeous! Those are all gorgeous! Love the flags in the blue bag, what a great idea. And the turquoise one is stunning…. looks like something in a fancy-schmancy boutiuque. Good luck with your grapes, we had grapes when I was growing up and if I ever get completely settled somewhere, a grape arbor is definitely on the wish list! Gwen is off to middle school. Wow. wow! i’m so impressed! 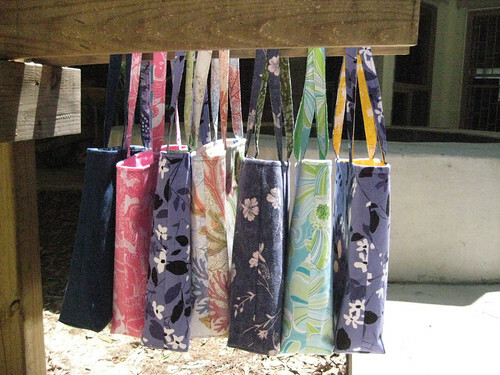 did you use a pattern for the bags or did you make one up yourself? i’d love your pattern if there is one. i know gwen’s teachers will just love these. i can’t believe she’s going to middle school! Wow, besides being a lot of work, you put a lot of thought into making them match the personality of the teacher. You are so good at things like that. Wow, the bags are stunning (love the flower one in the last pic). And Middle School?? Already? She can’t possibly getting that old!! How the time flies, eh? 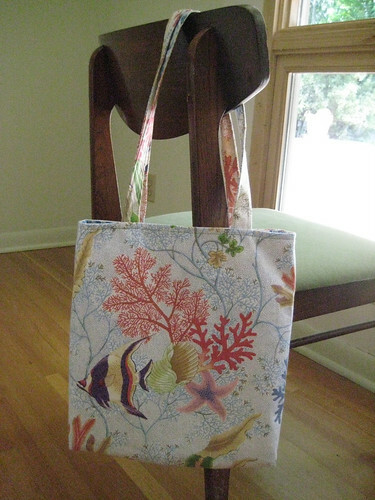 Oh, I love that pink whale fabric bag!!! Also, I had NO IDEA you had this blog! I thought you just stopped blogging altogether when I guess you just moved off LJ! I just saw you comment on flickr and found your blog that way! Yay!